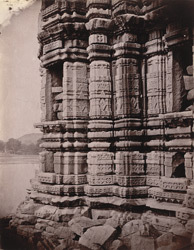 Photograph of the mouldings of the façade of the Kakra Math Temple at Mahoba, taken by Joseph David Beglar in 187-72. The place is described in the North-Western Provinces List of 1891: "The Kakra Math stands on a rocky island in the north-west corner of the Madan-Sagar. In size it is equal to the largest of the Khajuraho temples...It is built entirely of granite, and is therefore much inferior to the Khajuraho temples in decoration; its architectural ornaments being limited to such small geometrical patterns as could be executed without much difficulty in hard granite. The general arrangement of five chambers is similar to that of most Hindu temples of the same period; but the size of the mahamandapa, or transept, is greater than that of any of the Khajuraho temples. On each of the outer face of the sanctum there are three niches for the reception of statues; but neither outside nor inside can be found even the fragment of a figure. The name Kakra is said to refer to the worship of Siva."